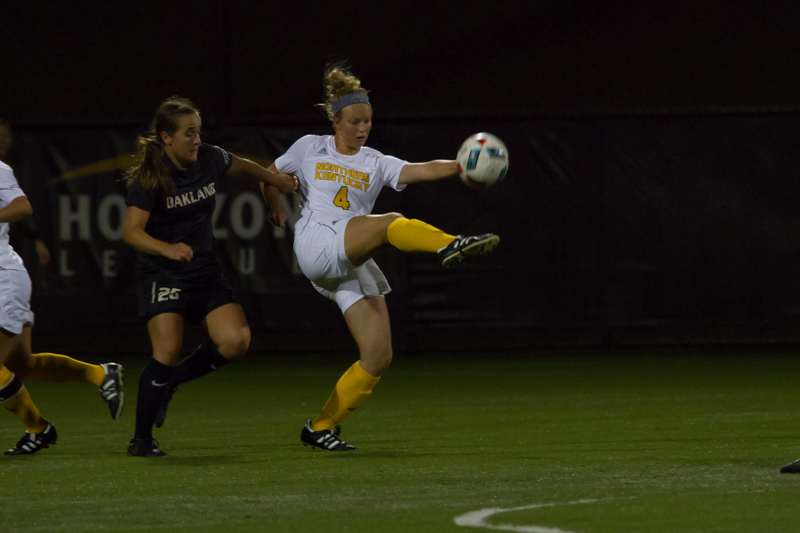 The NKU womens’ soccer team got its revenge on Wednesday night, beating the defending Horizon League champion Oakland Grizzlies 2-1. The win brings the Norse record back above .500 to 6-5, while the Grizzlies fall to 4-7-1. The win tonight was a huge boost of confidence to Erin Sutton, who, much like the rest of her teammates, still had the bad taste from losing in the semifinal game in 2015 to this same Grizzly team. The Norse have had a season of bad bounces and bad breaks. Tonight’s game was no exception either. In the 19th minute of the game, Newton chased down a ball in the box and attempted to clear out of bounds, but instead slipped past the ball and allowed Oakland’s Alice Palmer to collect the loose ball and score to give the Grizzlies a 1-0 lead. Newton and the Norse responded in the 31st minute, when Macy Hamblin made a backdoor pass to Newton on the left side, allowing Newton to score from 12 yards out to tie the game. The Norse had just gotten started . Two minutes later, Hamblin crossed a ball into the box to Shawna Zaken, who then found Erin Sutton for what would be the game winning goal. The goal was Sutton’s second on the season coming off the bench for the Norse, something she takes a lot of pride in. The one Oakland goal was no reflection of the game flow, however, as the Norse had control of the ball most of the game, shooting 13 times including six shots on goal while holding Oakland to eight shots. Oakland tried to play the Norse physically, collecting 12 fouls with much more pushing and body contact beyond that. Sutton said her team plays a similar style in practice and that helped prepare the Norse for this game. Jessica Frey and Emily Lohmann were both absent this game for the Norse in this game. Brooke Schocker made her first start of the year in place of Lohmann while Payton Naylor, Samantha Duwell, and Sutton did a nice job covering Frey’s role on the field. There is no time table for either one to return to action at this time. The Norse will travel north to face Cleveland State on Saturday afternoon. CSU is currently 4-5 on the season. The game will start at 4 p.m.